While much has been made of Japan's economic success up until the collapse of the real estate bubble in the late 1980s, the following years have been characterized by declining international competitiveness, low productivity levels among other industrialized countries and resistance to change at corporations. 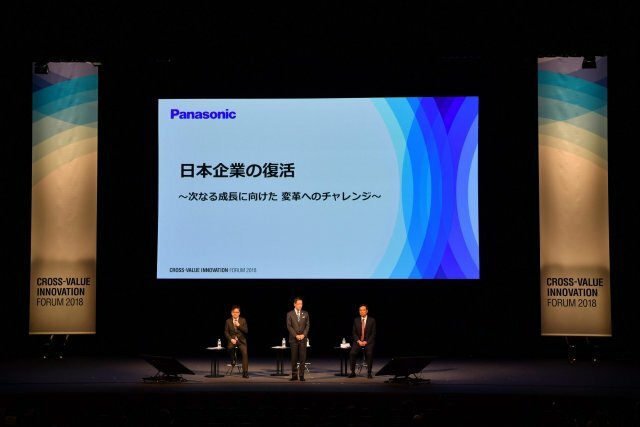 Executives like Yasuyuki Higuchi, CEO of Panasonic Corporation's Connected Solutions Company, and Takeshi Niinami, President & Chief Executive Officer of Suntory Holdings, stand out, however, as leaders driving corporate transformation. At a panel discussion held October 31, during Panasonic's Cross-Value Innovation Forum in Tokyo, Higuchi and Niinami were joined by moderator Professor Tomoyoshi Noda, the founder of Shizenkan University's Institute for Strategic Leadership, to discuss how Japanese companies can restore their position of leadership. Higuchi, Niinami and Noda happen to share a bond--they studied together at Harvard Business School. Higuchi and Niinami are also well-known in Japan for having fresh perspectives. While lifetime employment is common for executives and employees in Japan, both Higuchi and Niinami have enjoyed varied careers. Before returning to his first employer Panasonic in 2017, Higuchi was President of Microsoft Japan and served executive positions at other U.S. companies. Before joining Suntory, Niinami started his career at Mitsubishi Corporation and became President and CEO of the Lawson convenience store chain. Suntory, a food and beverage leader, made global headlines when it acquired the iconic American brands Jim Beam and Maker's Mark in 2014. Japanese Companies Like Sinking Ships? Higuchi summed up the situation facing Japanese companies by showing an illustration of a sinking ship. He said, "It's like a big ship in rough waters. Many on the ship are busy and occupied with internal matters, and oblivious to a hole in the hull. To top it off, there's a helicopter hovering nearby with a ladder for the company leader to climb off the ship. He won't be around for long, but the employees are stuck on the ship." Both men identified one common issue responsible for this situation: weak human resource systems and leadership. "Over the years, Japanese companies have reduced their HR budgets and the system does not properly nurture leaders," said Niinami. Higuchi agreed, noting that one effective way to nurture leaders is to put them into challenging situations while they are in their thirties so they figure things out on their own. Higuchi cited a failure to see the big picture, the global view, as another issue. He explained that although there is a lot of technological disruption taking place in countries like the U.S. and China, it is difficult to understand what is happening globally when situated in an island country like Japan. "Without seeing the world, how can you come up with the right strategy?" he asked. Higuchi cautioned, however, that in addition to seeing the big picture, it is also critical to understand what is happening in the field. The excessive formality often found at Japanese companies is another thing that needs to go, according to Higuchi. "In Japan there is a tendency toward doing the same thing over and over. But it's necessary to create an environment where people can speak out and escalate issues to top management with agility," he said. When asked what Niinami would do if he were made a leader at Panasonic, he had a surprising answer. "Actually, I would go back to the basics and revisit the founder's philosophy. That is what I did at Suntory." Niinami explained how he found precious value in the founder's words, despite a tendency for many in the company to forget them. He also noted that while it is important to embrace diversity, employees also need something that they can all get behind. This is especially true with a company like Suntory, which has made many acquisitions in Japan and around the world. "You need a common purpose," Niinami said. Higuchi agreed, noting that once employees in Japan fully understand an initiative, they rally behind it. Recalling his previous experience as President and COO of Daiei, which ran a chain of department stores, Higuchi noted the importance of soft power. "You can't just bring in some outsiders to change a company; you need to create an amicable situation for all employees," he said. Higuchi also addressed the issue of Japan's highly formal, ritualistic culture. "Because there are so many formalities, we have continued down this path without giving it a great deal of thought. We must transform the culture into one where we are able to say what needs to be said without the restrictions of the traditional concerns regarding age, gender, and title." Niinami made some recommendations for Japanese manufacturers by relating an anecdote from earlier in his career. He had to purchase coffee making machines from mid-sized German and Swiss manufacturers, but they would not budge on price, even for high-volume purchases, citing their principle that quality products are never subject to discounts. "I think this story actually signifies great potential for Japanese manufacturers," he said. "If customers really want something and there's good value, they'll pay for it. Japanese companies need to be better at communicating that value globally." Niinami closed with words of encouragement for Panasonic. "What should Panasonic create? You need to provide value to society, and I hope that you'll communicate this message globally. To be a central player for the next 100 years, you can only do this by being a diversified company unified by a common goal."